This guy needs no introduction whatsoever. “Tony” and “Hawk” are the only two words needed. This guy has been around from pretty much the beginning of professional skateboarding. 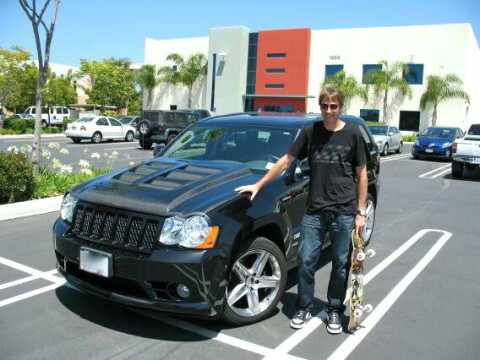 Dominating throughout his career on the pro circuit and the X Games, his fame has led him from MTV to Gumball 3000, from his own console games to help create a fan-based decal that’ll be featured on the Lexus IS-F CCS-R.
Tony Hawk owns a Jeep Wrangler Unlimited as well as this Jeep Hennessey SRT 600. With a stunning 0-60 time of 3.4 seconds, this is one maniac of a 4X4. It’s a super cool ride, but that carbon fiber hood looks a little incongruous and after market.